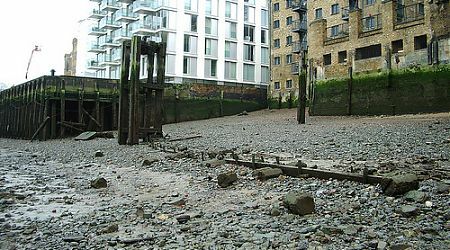 This foreshore site has been under investigation since the early 1990s by UCL (Institute of Archaeology), the Thames Archaeological Survey, English Heritage and Museum of London Archaeology. 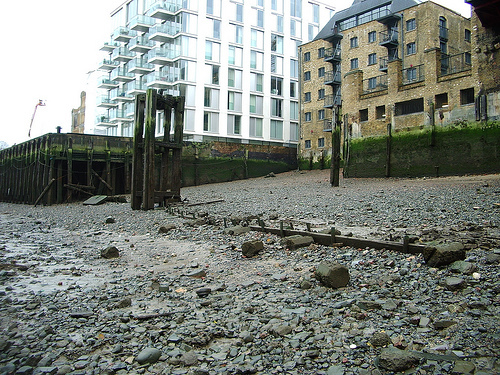 Significant archaeological remains include an assemblage of prehistoric artefacts ranging in date from the Mesolithic period to the Iron Age, a well preserved sequence of foreshore deposits (protected by the existing Chambers Wharf jetty) and a large and varied group of post-medieval structures including a possible fish trap, nautical timbers (some reused as gridirons) and artefacts relating to riverside industry such as sugar refinery ware. The skeleton of a young female, dated to the late medieval period, was excavated on this site, and artefacts relating to modern Hindu activity have also been recorded. Check out the articles below to learn more about Bermondsey.